Take the Indian Trail exit. Turn left on Indian Trail crossing back over Interstate 85. 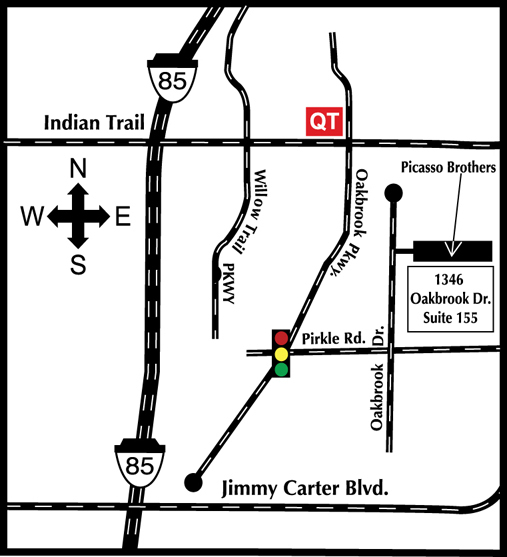 Turn right onto Oakbrook Parkway. Turn left at the second light (Pirkle Road). Turn left onto Oakbrook Drive at the 4 way stop. Building 1346 is on the right. Straight back to Suite 155.
at the 4 way stop. Building 1346 is on the right. Straight back to Suite 155.